Custom wall murals are considered as one of the excellent ways to liven up your outdoor space, home, or office. In fact, as opposed to applying new paint color, most businesses, as well as homes, choose a wall mural that embodies the spirit of their work and living space. Either way, if you’re still hesitant to invest in custom wall murals then now is the right time to know its several advantages. But before that, let us first find out who can benefit from customer wall murals. Who Can Benefit from Custom Wall Murals? Retail signs communicate with clients in ways which help in promoting products and sales events. Your store signage can be made to complement your corporate logos and store decoration that has an additional advantage of improving brand awareness. This kind of business benefits greatly by utilizing sing products. Furthermore, there are lots of sign options which are useful for this kind of business. Without a doubt, wall murals are eye-catching. In fact, they demand attention from your new and old customers. Furthermore, they will make your images or brand really pop. For example, wall murals can be used as head-turning ads that show lots of information compared to traditional marketing methods. 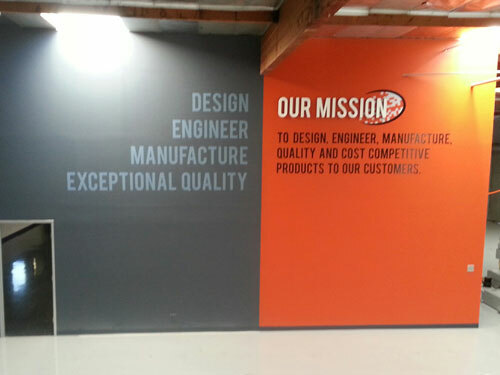 One of the most common benefits businesses could get from utilizing a wall mural is personalization. It means you can include your own ideas as well as personalize the wall murals on canvas to acquire the perfect result. Actually, there are lots of industries who are offering custom wall murals. Most businesses forget to utilize every square foot possible to make a long lasting brand impression. Even so, other wallpaper options don’t allow the majority of business to personalize their walls, whereas custom wall murals allow every business to incorporate their logos, colors, as well as slogans. Painting needs a few days to finish and let us not talk about the time intended for drying. Wall murals, on the other hand, can be installed easily and efficiently. Additionally, painting needs an even and smoother surface, but wall murals have several selections for your textured surface. One of the serious advantages of custom vinyl wall murals over hand-painted murals is that they’re changeable and replaceable. If your mural printing fades, is ruined over time or just need an update changing it is quite expensive. Meaning, you need to spend large amounts from your business budget. Removable wall murals usually need fewer material and hours of labor compared to hand-painted ones. In addition, if you’re planning to revolve your murals, hiring a painter will cost you a lot. On the other hand, maintaining for vinyl murals is definitely easier that marinating a hand-painted one. In fact, you can clean them as if you’re cleaning a normal wall. The unique appearance of a mural wall can definitely create a statement. For businesses, when utilized creatively along with your logo and brand, these artworks will leave a positive idea on your clients. They also help them to determine what your business all about. In the same way, wall murals work surprisingly in housing settings. As we all know, a conference room is a perfect place for making important business decisions and you can’t always expect that every conference room has a stunning background. What comes to your rescue in this situation are the custom wall murals to show the various achievements of your business. An employee lunchroom or break room with relaxing wall murals as well as visually pleasing graphics can serve as a treat for the eyes your staff who otherwise spend a couple of hours staring at the computer monitor. As a matter of fact, a peaceful environment allows your workers to rebuild their energy levels. Decorating your business premises with custom wall murals may seem like an avoidable expense, but as you can see it has definite benefits. However, it is up to you whether you will invest in wall murals or not. But nevertheless, we hope that this content helps you a lot in making a decision.